Art imitates a life of crime. Jasper knows you don’t quit the movie business. The movie business quits you. And Jasper truly believes he can make a movie Hollywood will want—Badly. 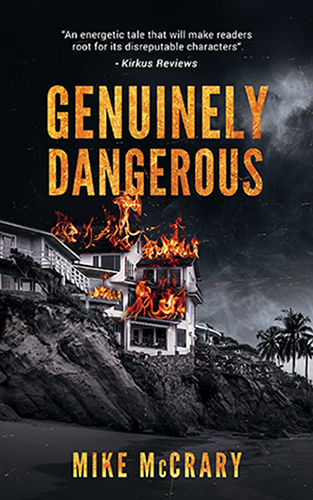 Genuinely Dangerous follows the nightmarish yet hilarious journey of Jasper Tripp, a down-and-out filmmaker who embeds himself in a crew of wild and mysterious criminals so he can film a documentary that’ll land him back in the Hollywood fast lane. From Mike McCrary, author of Remo Went Rogue, comes another unfiltered, unpredictable romp of a thriller where the insane becomes sane and life itself becomes Genuinely Dangerous.